*The complete patters for these is now available in my Saint Puppet Ebook! I developed this craft to use with my preschool co-op class, who are all 2 years old. This is the version I intended for them to make. (They didn’t get to make theirs yet because class was canceled this week due to weather). 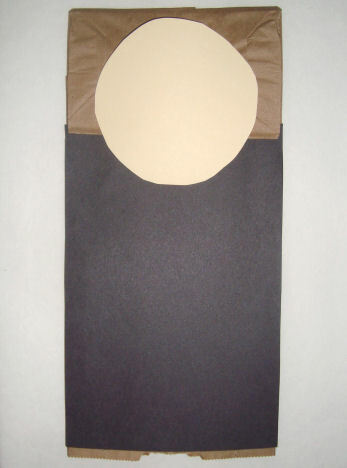 To get the size of the dress right, just trace the paper bag onto black paper. First glue on the rectangle for the dress, then the side pieces of the habit, then the white rectangle of the habit, then the top black rectangle. Add the white collar piece. Then decorate the face as desired and add any additional pieces you’d like. When assembling, be sure to hang the head half way off of the bag flap so it functions as a puppet. 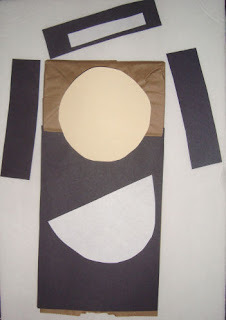 Let the habit pieces hang down- don’t attach them to the body or the puppet won’t work. 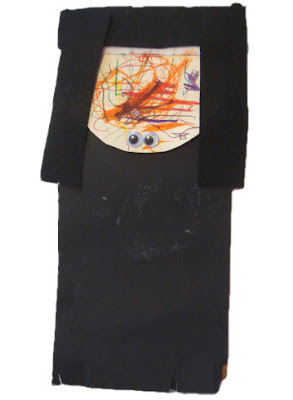 Sometimes, when this craft is made by a 2 year old, it turns out like this. Who am I to argue with an “artist”? If that’s where he wants the eyes, I say “That’s very creative, Julian!”. 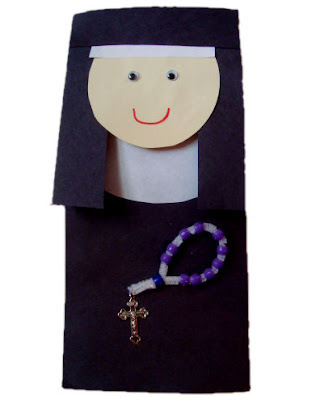 I wanted my preschool class to make little rosaries for their nuns. I think this will be a big hit, because 2 year olds love to string stuff. I’m providing half a pipe cleaner each and some regular pony beads. My plan is to encourage them to string on 10 beads for a 1 decade rosary. Stringing onto pipe cleaners is super easy to do because they’re already stiff, and the pony beads just stay on- no falling off the bottom. Bring the loop around, twist it shut, stick on one more bead for the “Our Father” and add a crucifix to the end. I have a pack of these crucifixes from Autom- they’re only 9 cents each! 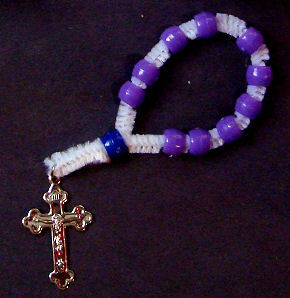 I love to let kids use them for crafts because they’re no good for regular rosaries. (They’re not much more sturdy than aluminum foil). 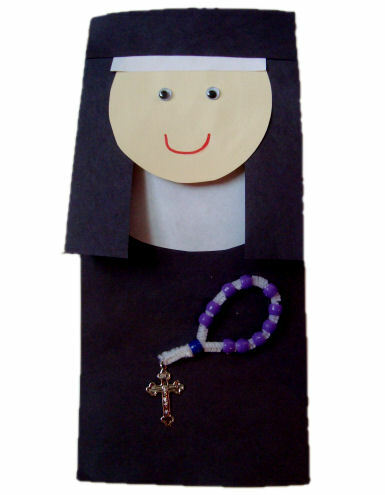 You can just glue these rosaries right onto the puppet. If you don’t have any crucifixes, just cut some crosses out of paper. Because we studied monstrances last week for “M”, Lydia was absolutely insistant that her nun have a monstrance instead of a rosary. My reply to that? “Sure! She can be Saint Clare!”. (Who, by the way, would actually have a brown robe). This one was all Lydia. She did all the cutting, gluing, and designing. She (of course) chose the largest googly eyes I had, and multiple colored markers for the face. She even traced around a can for the head and cut the circle out herself. She’s almost 5. The monstrance she needed help with. I helped her to cut out the yellow piece like you would a simple snowflake craft by folding it first, and then cutting. We used felt for her habit because I actually ran out of black paper. Can you believe that? Then I made a nun with a monstrance, too! So if adding a monstrance turns a generic Mother Superior to St. Clare, who does the nun become with some roses? For extra fun, dress up like a nun when teaching your preschool for the letter “N”. 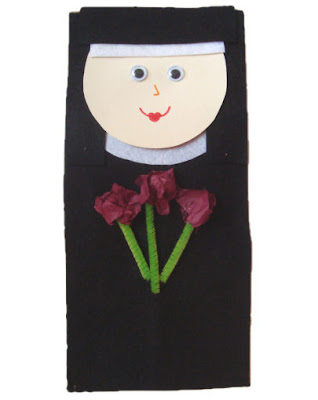 You have no excuse not to because I posted directions for making the world’s easiest nun costume ever yesterday! (And now it allllll makes since.) 😉 And dress your daughters up like nuns, too. So much fun! How cute! My daughter loved the little rosary! 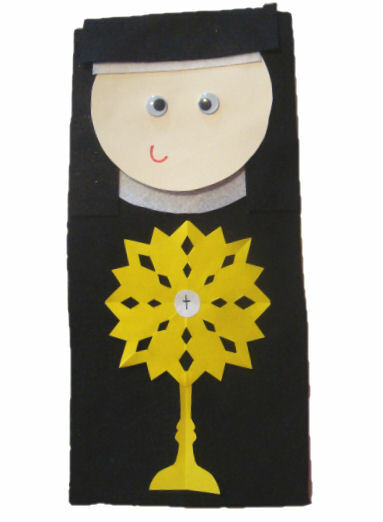 Maybe after the children finish making their puppet, they can make their puppet say/pray a Glory Be or a Hail Mary! These were great! It was the perfect project for a snowy/icy day. My 4 and 2 year olds made them. 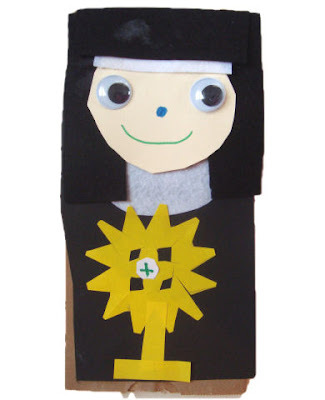 My 4 year old wanted to make hers St. Theresa as that is one of her favorite saints. As we were making them, my daughter said "I hope I can be a nun someday, mommy". This was so great. Thank you for the inspiration. Those are too precious!!!! I dare say, though, one of your nuns could use a pair of glasses ;). Hey, sweet lady with my favorite blog: I'm wondering if you have any recommendations for printing an individual entry. Sometimes I can highlight the entry and print selection – other times that prints pages and pages of junk. Sometimes I can copy and paste into a word processor – other times it pastes just a few lines of junk. What to do? Thanks and God bless. Just wanted to thank you for the wonderful, creative site. 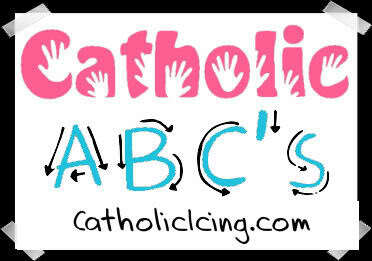 I am a veteran Catholic School teacher who is delighting in all that you are sharing. I’ve been forwarding your newsletters to my friends who are teachers, administrators and directors of various ministries for the Brooklyn Diocese. Bless you for sharing your talent and your treasures with us! These are really cute and a great project to have on-hand. 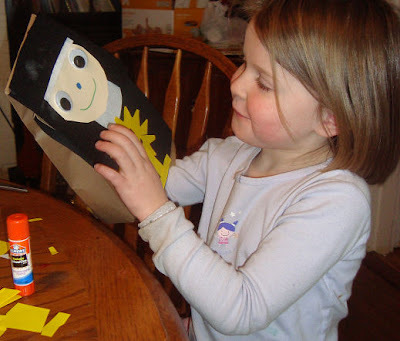 We changed the black construction paper to blue and made the Blessed Mother to celebrate May and the rosary. I love your site. I get so many good ideas to work with my second graders.